December is here and we're in the holiday spirit at IAC! Darker, cold weather beers will be popping up throughout the month as the holiday festivities are upon us. We will be hosting a Toys For Tots Toy Drive for an entire week starting Monday, December 10th make sure you come out and donate a new unwrapped toy! We’re also fully stocked with IAC merchandise for the shopping season- new beanies, windbreakers, crewnecks, t-shirts, gift cards and more! You can stop by the brewery to shop for these items or shop online here. Happy Holidays! IAC will be hosting a Toys For Tots Toy Drive the week of 12/10-12/16. Bring in a new, unwrapped toy anytime during that week and get a pint of your choice for only $.01 (Limited 1 pint per customer, but bring as many toys as you'd like). 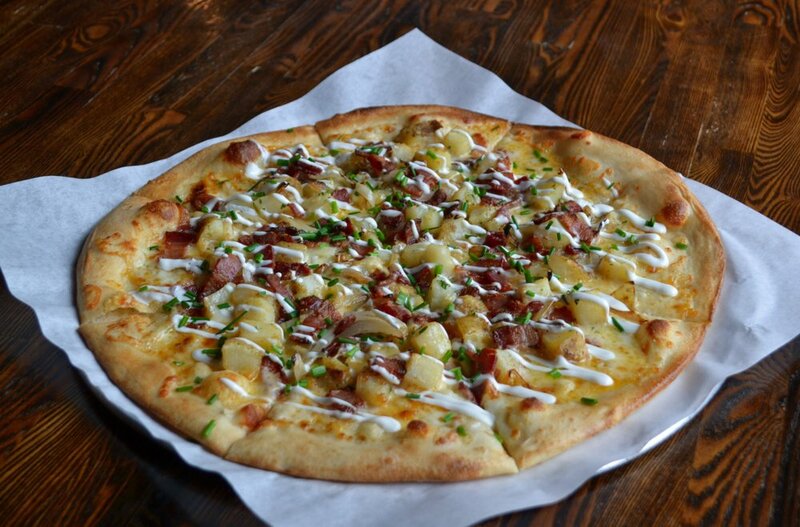 This month we decided to bring back a crowd favorite, The Loaded Potato Pizza! All your favorite flavors of a loaded baked potato are combined with our pizza crust. It has a rich and creamy Béchamel sauce with chunks of roasted potato, onions, cheddar/mozzarella cheese, bacon, sour cream and garnished with chives. This pizza pairs great with Ratched or Restraint. Every Tuesday from 7pm-9pm we host a special Institution trivia night with the most talented quiz master around. Come test your random knowledge with friends, grab a pint and some pizza! Winners receive IAC gift cards. These beers will be getting tapped in the tasting room soon. Check out our beer release calendar (above), and follow us on social media for the exact release dates! A traditional dark larger brewed to be easy drinking and refreshing. Schwarzbiers may be dark in color but drink similarly to other lighter-colored lagers with just a touch more body and malt character. As much as we love brewing with adjuncts, especially in our dark beers, we decided to make Whispers To Screams as traditional as possible. This Oatmeal Stout uses Maris Otter, Pale, Oats and dark malts to create a silky smooth, balanced stout. Be on the lookout for cans as well. We brewed a collaboration beer with our friend in Goleta, Captain Fatty’s. The collab brewed at IAC is a West Coast Style IPA with Galaxy and Mosaic hops. Expect big tropical fruit flavor and aroma. Be on the lookout for the hazy version of this beer on tap at Captain Fatty’s spot. Our latest batch IPA is a piney and citrusy IPA loaded with Citra and Simcoe hops. This traditional West Coast IPA has firm bitterness, bright hop character and a clean finish. Our 2018 Holiday uses Figures (Vanilla Oatmeal Stout) as the base beer with holiday spices added. This is a small batch, so grab a pint while it’s around. A big West Coast IPA that is bright, bitter and heavily hopped. Citra, Columbus and Simcoe create dank and resiny hop flavors with aromas of citrus and pine. Relapse, our winter seasonal returns! Relapse is a malty, chewy red ale with rye malt and citrus-forward hops. It's the perfect beer for any hop head when colder weather hits - it's strong and malty but also bitter with huge hop character. This year’s Winter Seasonal is a luscious Imperial Stout loaded with five adjuncts - baked cacao nibs, vibrant locally roasted coffee, smooth and creamy vanilla beans, spicy habaneros and a dash of cinnamon. Perfect for the holidays, grab a 4-pack and share with friends and family. This DIPA is brewed and dry hopped with Cascade, Simcoe, Mosaic and Columbus hops. New school and classic hop varietals with the addition of Cryo hops (lupulin hop powder), create layers of dank, citrusy and resiny hop flavors. It has classic West Coast bitterness and a dry body. Here's what's on tap currently in the tasting room as of December 1st. 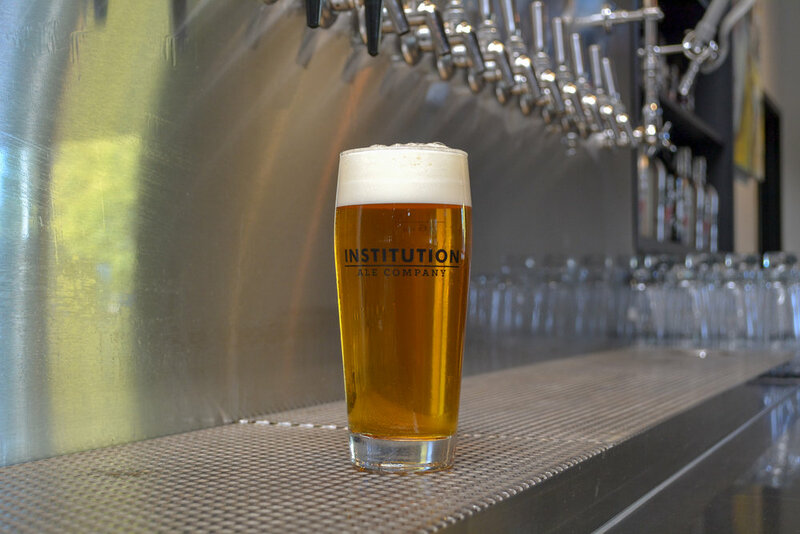 Visit www.institutionales.com/on-tap/ anytime for a daily and most up to date tap list. Our Community Craft Beer Benefit (Wednesday, December 12th): Join us at Enegren Brewing Co on December 12th as we join forces with 13 other local breweries and two wineries where 100% of proceeds will be donated to the victims and families of Borderline and local fires. The event is from 4-9pm. $6 pints/ glasses of wine and $2 tasters. Come by and support the community!